It is not often these days that an organ builder is asked to build a sumptuous chamber organ in the way it was done for private homes in the 18th century. A private customer from near Princeton, New Jersey, saw the Cabinet Organ we made for the Chapel of Princeton University and asked us to design an instrument for his home. The result was this striking organ in a stained cherry wood case with a broken pediment. The carving is water-gilded and the front pipes of polished high percentage tin. 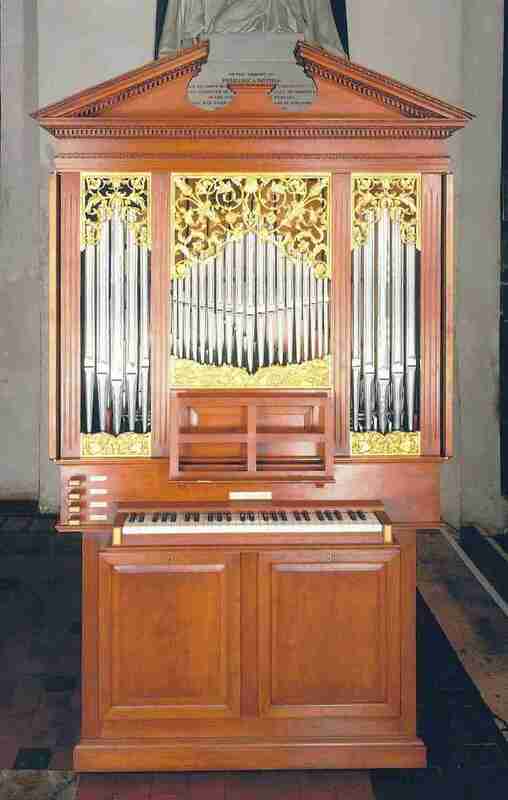 This instrument has a small two-rank mixture as its fourth stop but otherwise it displays the same attributes as the other chamber organs, with the facility for transposing to baroque pitch and the split stops, bass and treble. As with similar instruments, the stops themselves are in two parts so that they can be drawn together easily when they are used normally. This photograph was taken whilst the organ was on display at the 1997 St Alban's International Organ Festival where it generated a lot of attention.